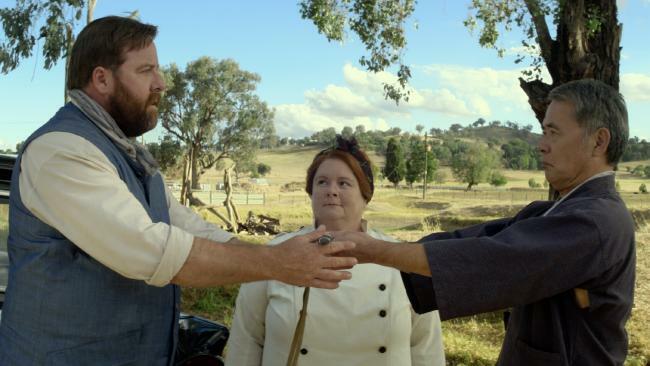 Shane Jacobson, Magda Szubanski and Kuni Hashimoto in a scene from The BBQ. THROUGH TV shows such as Fast Forward, Big Girls Blouse and Kath and Kim, Magda Szubanski has long been loved and admired as one of Australia's funniest woman. But according to Szubanski herself - and many of her comedian mates - she is just a "pale version" of her mother, Margaret, who died last year at the age of 92. Szubanski says her mother, who emigrated to Australia with her Polish father at the age of 24, was one of the funniest women on the planet who gave her daughter not only her sense of humour, but also a penchant for doing a Scottish accent that's so chumpy you could carve it. "My great regret is that she never met Maggie Smith," says Szubanski. "I had a night out on the town with (Maggie) once and we bonded over the Scottish accent. I said 'your Scottish accent is so good, you must have Scottish blood' and she said 'yes, my mother'. And we started comparing notes on the things that Scottish mothers said. "If I ever did a film I would get her to play my mum - there was that dry and hilarious humour. If you were to ask any of my famous comedy friends who know my mum, they would agree with me. And right to her death, still with the humour - it was extraordinary." That ear for an accent has made Szubanski the "go-to person" for all things Scottish, and her Celtic characters from the ridiculous, hard-drinking Wee Mary McGregor in Fast Forward right through to The Butcher, in the new Aussie comedy The BBQ have been in part a tribute to her mother. Szubanski also maintains "it's hard to be unfunny in a Scottish accent" and over the years has gleefully mined her mother's rich array of incomprehensible Scottish phrases such as "haud yer wheesht, ye wee bizzum" (translation "be quiet you little brat"). 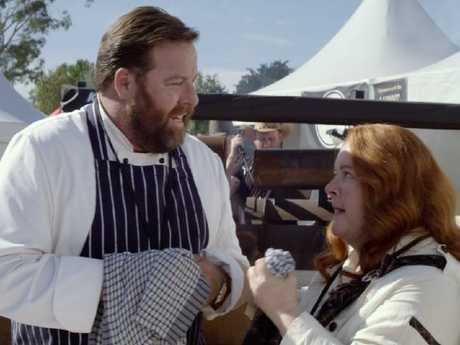 Old mates Shane Jacobson and Magda Szubanski in a scene from The BBQ. 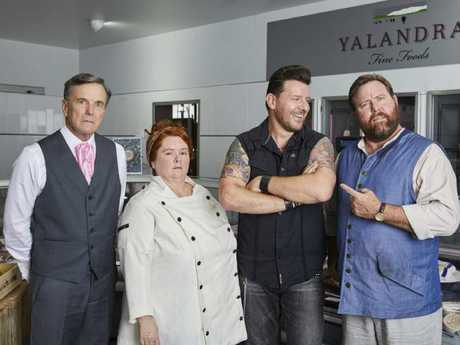 "It's a great character - really eccentric," says Szubanski of The Butcher, a rough-hewn meat specialist who helps Shane Jacobson's character exact revenge over Manu Feildel's smarmy Frenchman in a cooking competition. "And frankly, any chance I get to trot out my Scots accent, I am more than happy. I feel very at home in it. A lot of my most fun characters, I seem to end up with red wigs and if it's not a red wig it's a Scots accent. And this time it's both. It's playing to my strengths. And there are really not a lot of feature film comedy scripts out there - it's not something we are terribly dedicated to in this country. So it was that, and that Shane was involved and it was just a fun film and a fun role." 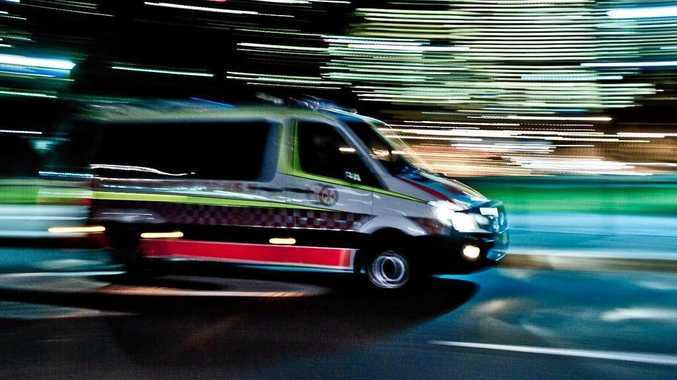 Although she's best known for her TV roles, Szubanski has also appeared in a steady stream of films since making her feature debut as Esme Hoggett in the 1995 smash hit comedy, Babe. Most recently she had a small role in Ben Elton's Three Summers and jumped at the chance to be in The BBQ, lamenting the scarcity of Australian comedy films. Magda Szubanski as Sharon Strezleckie from Kath and Kim. "There are very few things that come to me - they are just not happening," she says. "I don't know why - I think funding for things has gotten very tight - and I think we have squandered a lot of the skills that we had that were built up through those years of variety television and then sketch comedy. Because there is a particular way of shooting and editing and pacing comedy and I think we don't treasure talent and skill here in the way they do in the US. We sort of piss it up against the wall at times. And it's such a shame because we have so many talented people here and that's why there is the drain that goes to the US because there are just not the opportunities here." Next up on Szubanski's dance card is her role as the host of the SBS coverage of next month's Sydney Gay and Lesbian Mardi Gras. As strident advocate of LGBTQI rights since coming out on Valentine's Day six years ago, and a prominent proponent of the Yes vote in the recent marriage equality plebiscite, Szubanski is expecting this year's 40th anniversary event to be particularly special. The BBQ stars Nicholas Hammond, Magda Szubanski, Manu Feildel and Shane Jacobson. "Oh God yes," she says with a laugh. "Imagine if it had been a no. It would have been like a wake." She says that two of her closest gay friends have already been married and hopes that the coming event will help bring together even those who voted No in the divisive campaign. "We come in peace, the LGBTQI people, we are not coming with a wrecking ball, we want to add what we can bring to what has sometimes become quite a meaningless contract," she says. "And because we have had to fight so hard for it, boy it means a lot to us. So coming up to Mardi Gras - it's huge." The BBQ opens tomorrow. Sydney Gay and Lesbian Mardi Gras, March 4, SBS, 8.30pm.